Last week a friend visited and brought with her some beautiful lemons from the tree in her garden. I decided there and then I had to do something other than squeeze them on my salad. And then it dawned on me. I’m British, and yet I have never made or eaten lemon curd. I’m sure if the British Government knew they would take my passport away. So I resolved to make lemon curd. But then what? Would I eat it by the spoonful? Would I spread it on toast? 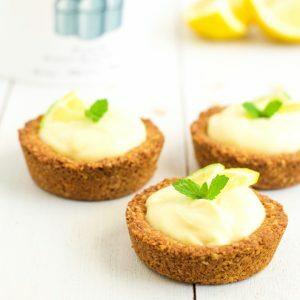 Or would I mix it with the thickest, creamiest yogurt I know, and dollop it onto freshly baked granola cups to make these lemon granola tartlets? I think you can guess which option won. Lemon curd has been eaten in England since the 1800s. It is usually made with butter, egg yolks, lemon juice and zest, and sugar. But in an effort to make it a wee bit healthier, I switched out the sugar and used a small amount of honey in its place. I then chose Siggi’s plain whole milk yogurt to mix it with for the filling. I don’t usually promote particular products, but I do love Siggi’s yogurt. It is thicker than any yogurt I have ever known, and is made with simple ingredients. Their plain whole milk yogurt has just 3 ingredients – milk, cream, and live active cultures – and contains a whopping 25 grams of protein per cup. As for the base, I wanted to make a sweet treat that was filling and wholesome, while still being tasty and decadent. So I whizzed some oats, almonds, and coconut in the food processor, and added a little honey, coconut oil, and vanilla. After molding them into muffin cups, I baked them until they were golden brown and lightly crispy. 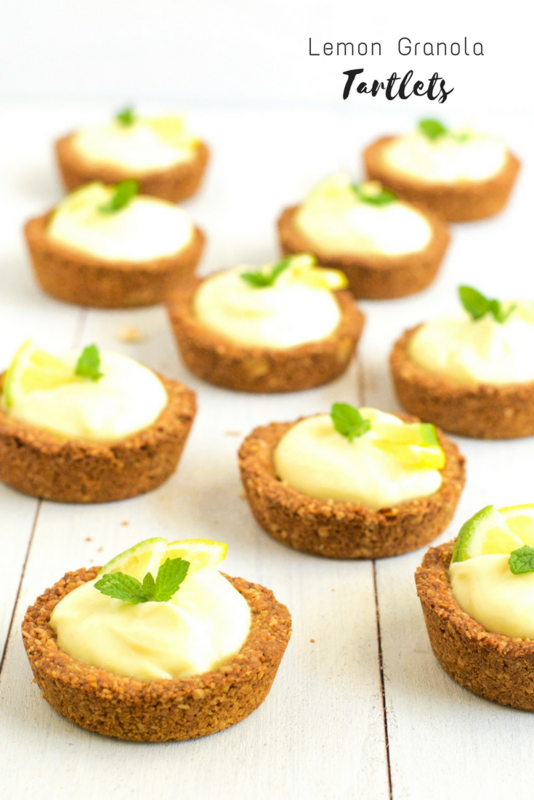 The combo of the sweet, crunchy base and cold, tart, creamy lemon curd yogurt makes these lemon granola tartlets simply divine. And the best part? I have plenty of leftover lemon curd to swirl into yogurt or eat by the spoonful. In a large bowl, cream together the butter and honey with an electric hand whisk. Add the egg yolks and eggs one at a time while beating the mixture. Add the lemon juice and zest, and blend once more. Don’t worry if it looks curdled at this point. Set up a very fine sieve or strainer over a medium sized bowl ready for after the cooking process. Pour the mixture in a medium pan and place over a low heat. Cook slowly, stirring the whole time, until the mixture thickens and looks smooth and shiny. It should be thick enough to leave a distinct line when you run your finger or a spoon along the surface. This will take about 12 – 15 minutes. Don’t stop stirring and don’t let it boil. You should stop right before it boils. Remove from the heat and pour the mixture through the sieve or strainer. You might need to help it through a little with the back of a spoon. This will get rid of the zest and any coagulated egg. Discard the solids, and leave the lemon curd to cool. Preheat the oven to 350F and grease a muffin pan. Place the oats, almonds, and coconut in a food processor and pulse until fairly fine. Put the oats mixture into a large bowl. Warm the coconut oil and honey either in a mug in the microwave for 20 seconds, or in a small pan. Add the coconut oil mixture, vanilla, and salt to the oats and stir well to combine. Put 1 heaping tablespoon of mixture into each cup of the muffin pan. Press the mixture into the base and slightly up the sides of each muffin cup, making a shallow bowl. Put the muffin pan in the oven and bake for 12 minutes, or until lightly golden brown. Remove from the oven and leave to cool for 5 minutes in the muffin pan. Then turn out onto a cooling rack and leave to cool completely. 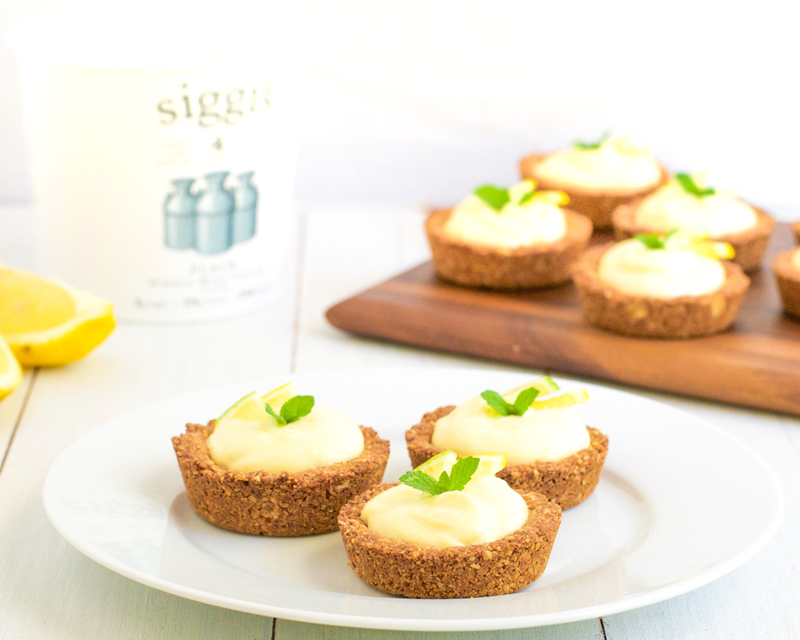 Mix together 1 cup of Siggi’s plain whole milk yogurt, ½ cup of the lemon curd, and a drizzle of honey (to taste). 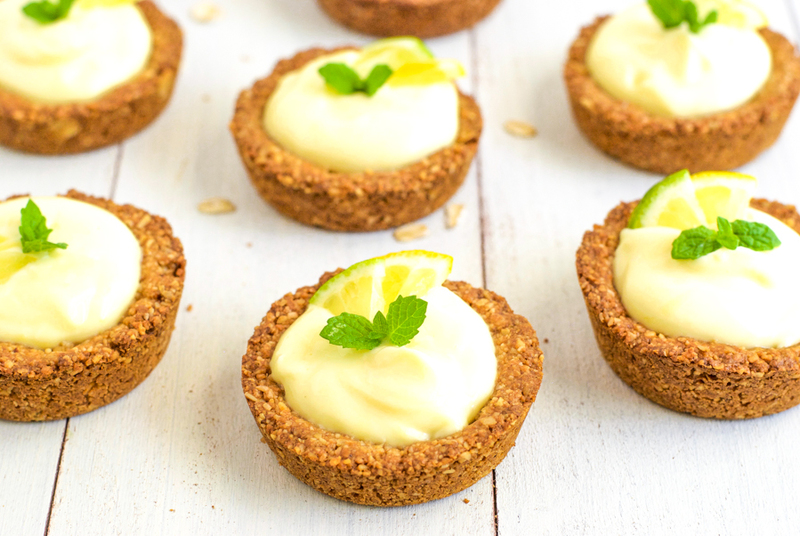 Fill each granola cup with the lemon yogurt mixture and enjoy. If not eaten right away, store in a container in the fridge. Store any leftover lemon curd in an airtight container in the fridge for up to one week, or in the freezer for up to 1 month. Wow, These look amazing. I’m thinking of trying a lemon cheesecake topping instead. I have a few lemons nearing the end of their time and a container of soft white cheese expiring. Thank you for the inspiration! Hi Miriam, thank you for your comment. 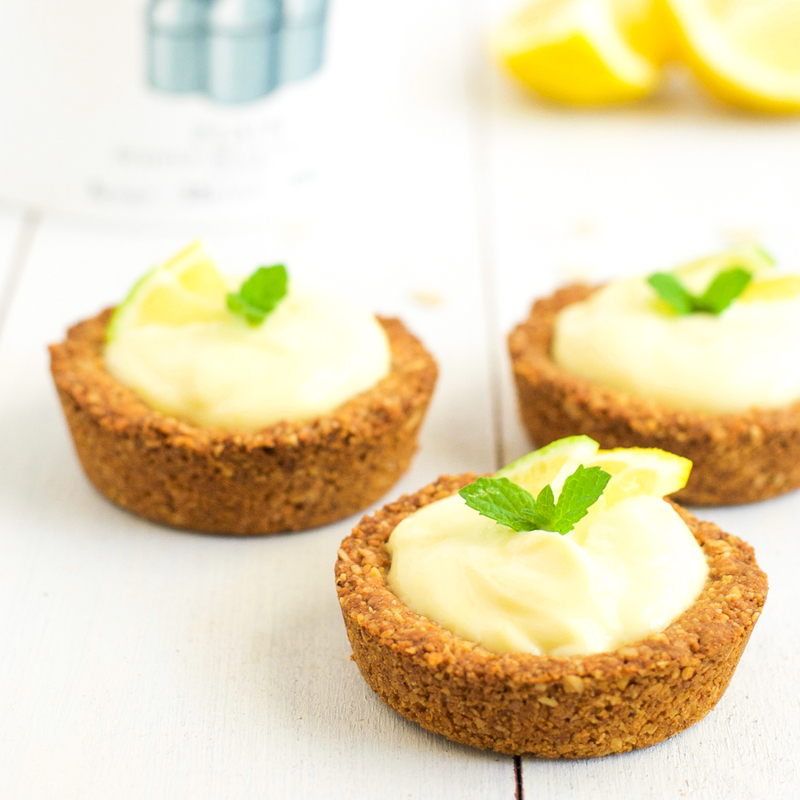 A lemon cheesecake topping sounds delicious! What a great idea. These are delectable, to say the least! I pinned to my recipes to try soon board! wow! it looks Yummy! can not wait to try it out! thanks!